Asia’s largest digitally synchronised forum for professionals titled ‘Momentum’ was held simultaneously at four locations in Colombo last week. 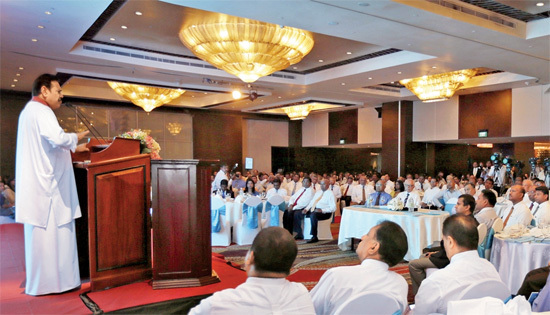 Billed as the first digitally synchronised forum in Sri Lanka, the event underscored the importance of stability to Sri Lanka’s business and economic landscape. NDB Capital Holdings PLC and Zephyr Management launched the Emerald Sri Lanka Fund, a US $ 50 million private equity fund to finance small and medium enterprises (SMEs) in the country. The fund will create a vibrant and sustainable SME sector and is an integral part of overall funding in Sri Lanka. It will give tremendous opportunities for SMEs to obtain funding. Sri Lanka, launched its first-ever technical sessions on industrial chemicals last week and a top team from the Hague's Organisation for the Prohibition of Chemical Weapons (OPCW), was here to upgrade Sri Lanka's industrial chemical expertise to the next level. The Central Bank provided Rs. 6 billion to The Finance Company PLC (TFC)to restructure the company. TFC, being the first finance company to se set up in Sri Lanka, has cultivated a reputation of being a pioneer in not only the finance industry but in many other aspects. A 132-member business delegation representing 59 companies from the Sichuan Province of China is in Colombo seeking trade and investment opportunities. The B-to-B meeting with the Sri Lankan counterparts is due to be held today at the Galadari Hotel. The event has been organised by Sri Lanka-China Trade and Investment Promotion Chamber (SLCTIPC). With the year coming to a close and a few more days for the new year, the business community expressed mixed sentiments about the past year and the year ahead. Some corporate and Chamber heads were pleased with the growth in business given the political stability and business environment.